Just like most of you I'm sure, this past weekend had taken on a melancholy tone because of the tragedy that occurred at Sandy Hook Elementary in Newtown, CT. You know, sometimes tragedies happen in other parts of the country and I'm able to continue on like "business as usual", because it doesn't exactly seem real. It's like watching another television show. But then other times, something big happens and it stops me in my tracks, actually hits home or affects me emotionally in some way. This was definitely one of the latter. I mean, think about the weather here in Georgia (and other parts of the eastern U.S.) the past 2 days. It's like the Earth is even mourning those little children (and adults) who lost their lives. It has been nothing but gray skies and nonstop rain. Touché, Mother Earth. Touché. Anyway, I guess this is kind of an outfit post. Me and hubs were able to be child-free for a few ours on Saturday, so I decided to try to perk up my somber mood with some color. Who doesn't love pink? 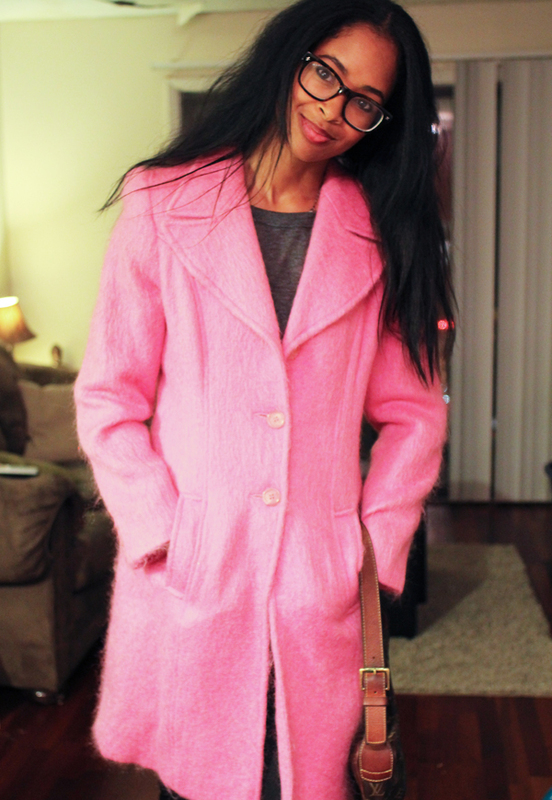 I'm talking a whole lotta' pink. I really didn't have any intention of making this ensemble into an outfit post, so the pics are somewhat half-assed. LOVE your coat!!! Pretty in pink! glad it helped to brighten your mood. 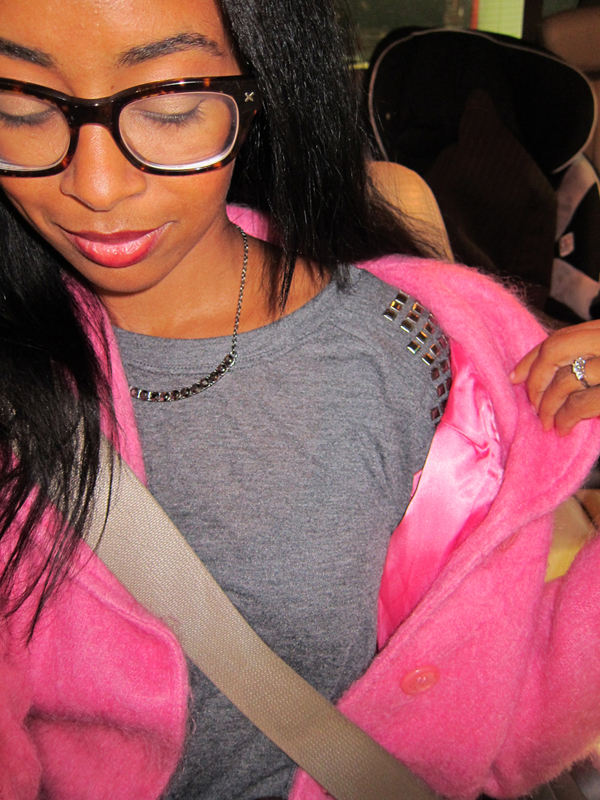 the pink is hot...but I'm in love with the studded tee!! What's the deets on your specs? Your arms--I think the key is first to make sure your ends are in good shape, make sure you trim them here and there. Next, I would say is to click on the YOUTUBE tab at the top of my blog, I have a vid showing how I straighten my hair with this special comb that I use with the flat iron. It makes ALL the difference for me. Click the "Hair Babble" tab as well, I've talked about products and the comb on there as well. I bought it off of ebay. Search on ebay for "straightening comb" "Brazilian Keratin comb" "flat iron comb". HTH! Posting a video on my specs this weekend, Anon. Stay tuned! amazing coat! Love the bright pink! I agree...melancholy is a good choice of word to describe the feeling from what has happened. the sandy hook shooting is so sad. i feel kind of bad admitting this, but i've actually been avoiding the coverage of it. and i'm glad you mentioned the adults who lost their lives that day as well. i'd hate for their names to be forgotten. Great outfit, I love it ! !